I first wrote about Pastor Terry Jones in 2010 when he made news by planning to burn several copies of The Koran outside his Dove World Outreach Center in Florida. After fervent public opposition by then US Secretary of Defense Robert Gates and General David Petraeus, Terry called off the event. Aside from a pro-George Zimmerman rally and a 2012 run for president, he has remained somewhat low key until a few days ago. Jones was arrested on September 11, 2013 in Polk County Florida for unlawfully transporting fuel, openly carrying a firearm, and cited for improper lighting on his trailer. His pickup truck was towing a smoker and a trailer filled with 2,998 kerosene-soaked copies of the Koran that he planned to burn at a rally in Loyce E. Harpe Park (despite being denied the necessary permits by county officials). 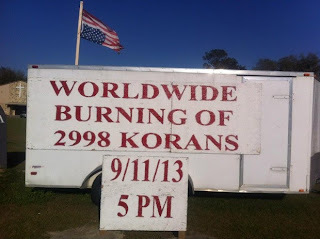 According to Pastor Terry, the number of Korans was significant as each copy represented “one of the victims, every person murdered by Islam” during the September 11th attacks. The number of Korans carried a poignant, but unintended, significance since it also included the 19 hijackers who perpetrated the attacks. While it is possible that Pastor Jones was subtly reminding us that everyone who lost their lives that day was a victim of barbarically-misguided religious interpretation, it is more likely that his kerosene budget dramatically eclipsed his research budget. His lack of attention to detail (or statistics) undermined the statement he thought he was making. Sixty of the victims of 9/11 were Muslims, ranging from a bank vice president with an office in the south tower to a man and his pregnant wife on board the flight that crashed into the north tower. Essentially this means that, for a small percentage of the victims, Terry Jones wishes to honor their death by burning copies of the very religious text they adhered to while alive. It is this adversarial “us or them” tone that attempts to satisfy our desire to transform complex moral or political issues into Facebook memes. Our willingness and ability to engage in informed discourse concerning the threats and challenges facing our nation has and should continue to define us. I find it ironic that, in a period of history where anyone with an Internet connection can access unprecedented amounts of data, statistics, and information, most of us still form our opinions on current events by reading the included caption on a shared status update. The elimination of these scourges, along with the immediate legalization of industrial hemp, formed the basis of his shockingly-unsuccessful 2012 presidential campaign platform. While Terry has the right to publicly espouse his views (burn permits notwithstanding), perhaps he will realize that many of the “victims” he wishes to memorialize would be vehemently opposed to his tactics. Of course, kerosene is infinitely easier to acquire than perspective.